A Torrington couple are selling their home and business following the erection of a wind farm in a field opposite their bungalow. Patricia and Arthur Poulton say they are being kept awake at night by the noise from a trio of giant turbines less than 500 metres from their home at Higher Darracott. The couple, who have operated their Deepmoor Metal Processors scrap metal business from the site for the last 21 years, said they now had no option but to sell up and move on. 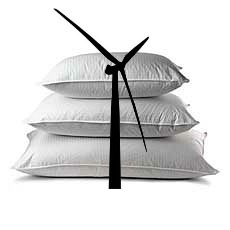 “I can hear the turbines through my pillow at night,” said Mrs Paulton, 70. One of the three wind turbines at Higher Darracott, near Torrington. “It’s a droning whooshing sound and as the blade passes the upright, the windier it gets, the noisier it gets. I have to close the window but you can still just about hear it through the double glazing. “It’s unbelievable the noise they make sometimes,” said Mr Paulton, 68. The 240ft turbines were constructed by FIM Services Ltd in March and became operational in April. Planning consent was originally refused by Torridge District Council in May 2004 but later granted by a Government Inspector following a High Court appeal by land owners. When the Gazette visited the couple on Wednesday, heavy blobs of white and grey cloud blotted out all but a few snatches of blue sky. On the hillside overlooking Torrington, two of the three turbines turned in a stiff breeze. On the approaches to the town, the first of 22 ESB Wind Development UK turbines can be seen being built at Fullabrook Down on the other side of the Taw Estuary. When the sun does shine here—especially towards the end of the day—the couple say the blades produce a “flicker shadow” over their bungalow. “The sun goes down right behind the turbines and you get this strobe effect,” said Mrs Paulton, who suffers from Ménière’s disease—a disorder of the inner ear that can affect hearing and balance. “They also produce a low frequency noise that you can’t hear but can cause dizziness, nausea and headaches. I’m not sure if it’s a coincidence but I’d not been ill for about five months but as soon as the turbines started I was sick for two weeks and have had to take the medication. The couple have been in contact with Torridge District Council and have been asked to fill in forms to record their disturbance. A spokesperson for the council said an official investigation had already started. The couple were keen to point out that they were not concerned about the turbines’ impact on the landscape. “We’re not bothered about how they look,” said Mrs Paulton. The Gazette contacted FIM Service but a spokesperson was unavailable for comment.